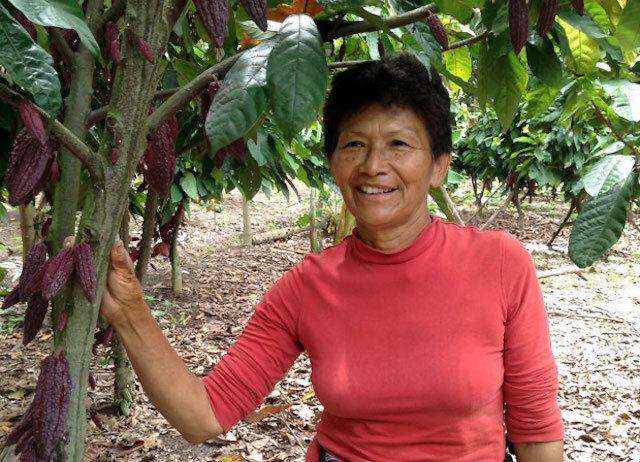 Belinda Saldaña grows cocoa as a legacy for her children and grandchildren. Her cocoa production nearly doubled after she adopted pruning and fertilization methods promoted by TechnoServe. Belinda Saldaña left her rural hometown of Piscoyacu, Peru decades ago to work as a maid in Lima. She worked long hours to earn a living while raising a family on her own. “I realized that I wouldn’t be able to get ahead with five children and little income,” said Belinda. But returning to Piscoyacu was not an option for a long time – until the 1990s, coca production and drug trafficking held a violent grip on the San Martín department, where Piscoyacu is located. Today, thanks to decades of investment in helping farmers grow alternatives to coca, San Martín has transformed into the site of Peru’s emerging cocoa industry. In 2008, Belinda decided to come home for the cocoa boom and planted seven hectares of cocoa trees on land inherited from her parents. “I didn’t know anything about cocoa,” said Belinda. She sought technical assistance but did not qualify for government programs directed at former coca growers. She hired help to prune her cocoa trees once a year, but they bore little fruit. Belinda joined TechnoServe’s San Martín Economic Development Alliance program in 2012 with the goal of increasing her cocoa yields and income. TechnoServe teaches Belinda and thousands of other farmers the best way to manage their cocoa trees through hands-on trainings on TAPS, the project’s innovative pruning and fertilization technique. “By applying TAPS, my cocoa plants are free of diseases and even better, productivity is increasing,” said Belinda. From 2013 to 2014, her cocoa harvest nearly doubled from 4,100 pounds to 7,900 pounds. "I’m very happy because even though I’m 60 years old I realize that I can continue learning, and by using the TAPS methodology and drip irrigation, I’m sure that I will have one of the best cocoa farms in the area." Belinda is also participating in a drip irrigation pilot to provide much-needed water and liquid fertilizer to her cocoa trees. Part of Belinda’s farm sits on a hill, leaving half of her cocoa trees high and dry. A TechnoServe agronomist mapped the best route to run irrigation tubes through the farm and helped Belinda apply for a local government permit to pump water from a nearby canal. 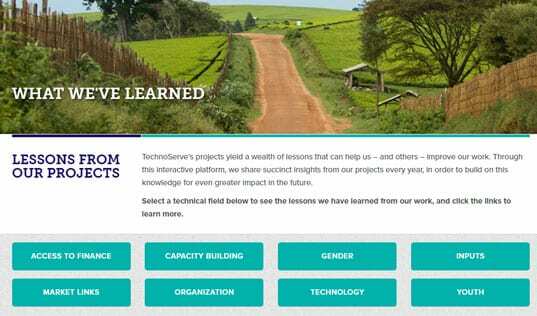 She paid for a third of the materials and installation costs, totaling about $4,500, and her contribution was matched by TechnoServe. Belinda can now easily pump water and nutrients to her cocoa trees, saving time and increasing productivity. Learn more about TechnoServe's work to promote a licit and sustainable economy in San Martín through cocoa.